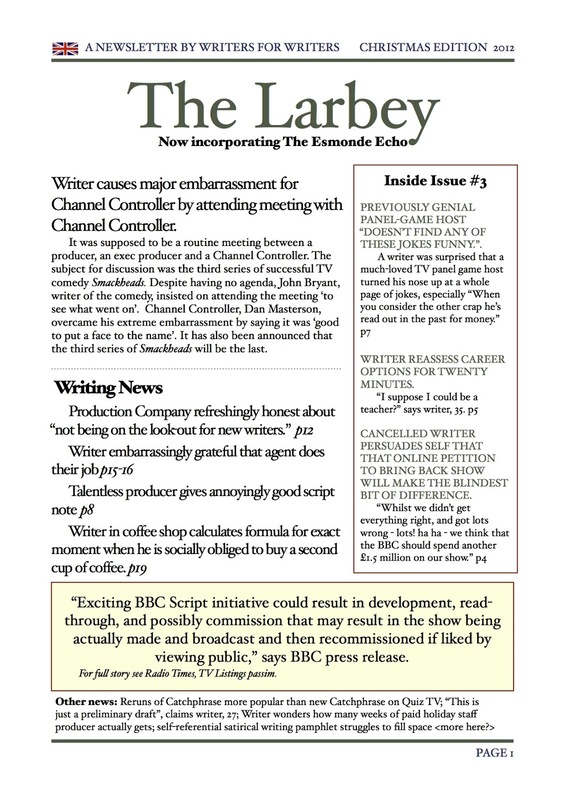 So, continued from the last post here, four more rules for the writer in production on his/her own show. You’re the writer. It’s your show. We get it. 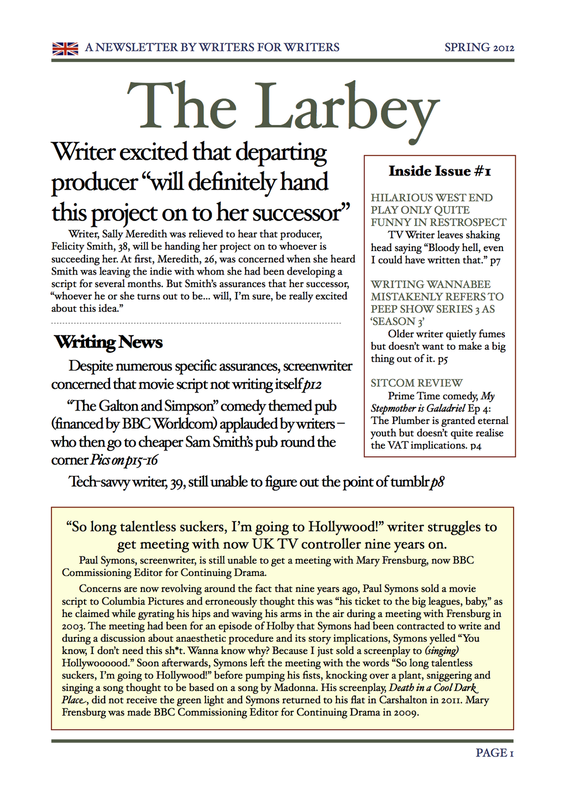 I put it like this because some writers can get into a siege mentality – the ‘they’re-ruining-my-amazing-show’ way of thinking you see in Episodes or countless tales of production woe told by writers in West End Sam Smith’s pubs. Undoubtedly, shows can be ruined by conflicting agendas. The channel feels its paid one type of show, the casting agent feels she’s casting a different type of show and/or the director likes to think he’s shooting a movie – and none of these overlap with the show in your head. But normally the warning signs are there early on with such clashes and conflicts. They need to be sorted out early. If you’re convinced the show the channel wants and the show your producer is making and the show you want to write are not the same show, address this before shooting. And bear in mind that plenty of shows have all these problem of conflicting agendas and still turn out okay – or prove to be hits for reasons that were not predicted by anyone. And plenty of shows are lots of fun to work and turn out to be dreadful. Usually, grounds for paranoia is unfounded. Maybe you’re a good writer, but it’s quite likely that everyone else on the set is equally good at what they do. Maybe even better. They are probably more experienced. You’ll discover your art department worked on the original series of Yes, Prime Minister - stuff you grew up watching. They’ve done this before. And they’re making the most of what’s on the page. Are you 100% confident in what you’ve put on that page? (See Rules One & Two). A TV Production is a well-oiled machine. As long as you feed it with decent scripts. But there are always problems. Your three hours of broadcast television probably has about a hundred scenes, which is going to involve a lot sets, props, costumes and lights. There’ll probably be some location filming which will involve trying to find affordable venues at the right time of day – with the right cast. And it can't happen as you'd like. Or your pencilled-in guest star might get a better offer to be in a movie or, even better, their own detective series on ITV. Given all of the above, stuff will go wrong. You will spot some problems on the horizon. You will be asked to approved a specially made prop that is technically correct but still hopelessly wrong. (see also Spinal Tap/Stonehenge incident). Maybe the props buyer or make was being overly literal, but the odds are that they had to guess because the script doesn’t specify every last detail (because you cut out loads of description because your producer told you to make the script shorter and you couldn’t beat to cut any of the jokes). If someone on the crew is being difficult or stupid, bear in mind that one of their kids might be in hospital and they’ve got more important things on their mind. Or, more likely, this might be the fourth show they’ve worked on that year. They’ve just done a sitcom set on a Nuclear Submarine, a comedy drama set in a Caribbean Hotel (but filmed near Penzance) and a Sunday Night TV period cop show in Bath. They’ve been busy. You’ve thought about nothing else but your show for the last year. Give them a break. Or at least help them help you. This rule needs no explanation. There isn't enough money. No matter what you're making and no matter how big the budget. Everyone feels they should be paid more. Everyone feels they should have a bigger budget. Everyone would like to take longer over the shot. Everyone one like one more take. It’s television. It’s not going to happen. No-one actively wants the show to be bad. I'm sure there are notable exceptions of sabotage but they're rare. Everyone's doing their best to make the best show they can with the time they have, and money they have - and they script they've been given. That's the only bit you ultimately control. So give each scene a few more minutes. Clarify that direction. Do your homework. And above all, be grateful that your job is infinitely easier, more interesting and better paid that most jobs in the world. Oh, and Rule Seven. Be nice to the runner. Why? Because it's good to be nice. But also because she'll probably be Head of Comedy in 15-20 years. To spend the day with Sitcomgeek talking about all things sitcom - along with the splendidly knowledgeable Dave Cohen, have a look here. Should you have the good fortune of having your sitcom script produced as a series, or even a pilot, you will find yourself having to make decisions, think about or offer an opinion, on a staggering number of things. It’s easy to forget that a TV show like, say, Cheers wasn’t shot in a bar, but a TV studio. Every single thing you saw in that bar was brought in and placed by a set designer, art director or props manager. Everything. That's a lot of decisions. It seems obvious, but the cast of Cheers were mostly fully-clothed. This meant decisions had to be made about what those clothes should be. Norm always walked in from work, and so needed to be in some kind of jacket and tie. Was this in the pilot script? At some point, very early on, between the writing department and the costume department, a writer or showrunner needed to decide what kind of job Norm Peterson did and therefore what clothes he would be walking into the bar wearing. In one sense, Norm’s clothes are unremarkable. Or at least, the audience don’t really notice them. They see a tired, large man after work avoiding his wife, Vera. So his clothes are equally tired. But choosing the right ones requires thought and a decision. Taking a sitcom from the script into a studio or a location shoot and then onto people’s screens at homes requires someone to make a decision about everything. So here are some rules of thumb I’ve recently come up with on recent operations that might be of interest. It’s an oft-repeated maxim by writers, but it’s no less true for it. ‘Nobody knows anything.’ Bear in mind this was said by William Goldman, the writer of successful movies and novels (including All the President’s Men, The Princess Bride, Butch Cassidy and the Sundance Kid, Marathan, A Bridge Too Far etc). If anyone has any right to claim they know something, it is William Goldman. And yet, he is the one who tells us that none of us really knows that they’re doing. How does this rule help us? It’s worth remembering that this scripts are slippery fish and very tricky to pin down. You do not have all the answers and should not think that you do. You do need a creative vision for your show. You need to have some guts and determination to see it through. But you are not Leonardo Da Vinci, a genius in a world of dullards. You’ve written a script that you think will probably be funny once shot, edited, graded and broadcast. That’s about as good as it gets. The point is that if you have a strong sense of your own flawed-ness, you might be easy to work with and nice. You might listen to good advice. Your director or producer’s suggestion that a scene is too complicated or confusing will be met with humility. The subsequent rewrite will, most likely, make the show better. Embrace this. You need all the help you can get. Having said all this, you do know roughly what you’re doing. You do know what your show is about, you know who your characters are and you know that jokes need to be clear and comprehensible. Things can be thrown in last minute that really lift the show, or the episode. A highly talented and creative actor sometimes say ‘Wouldn’t it be funny if I said x’ or ‘Wouldn’t it be funnier if I did y’. Sometimes the correct answer is ‘yes. Do that. Say that.' But sometimes you feel in your gut that’s the wrong way to go. Ideas or jokes can creep in that feel wrong, or are out of character, or are only funny if you already know how the scene is meant to run. Things can easily get overcooked. If you’re confident you have a rough idea of what you’re doing, you’ll know when to say ‘no’ to these ideas. And that will be fine because you might have had the grace to say ‘yes’ to other suggestions and ideas. So Rules One and Two covered. Rules Three to Six in the next post. 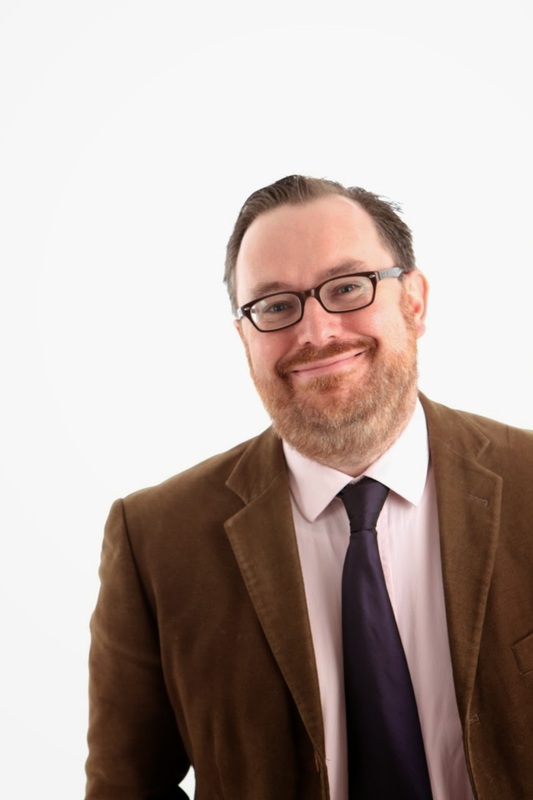 In the meantime, why not consider a day in London with Sitcomgeek and the highly experienced Dave Cohen learning about writing comedy for TV and Radio? More details here. Radio comedy is often seen as the poorer cousin of television; a testing bed or a training ground. From personal experience, I can say that it is certainly poorer financially, although it kept me going for quite a few years over the last decade. But although it's not going to make you rich, the upsides far outweight the downsides. I certainly wouldn't want to underrate the training aspect. I approach TV scripts with much more confidence because of the experience of writing half hour comedies for the radio. It's meant that I'm not as being freaked out by having to think of something new six times over, or cover 35-odd pages with coherent dialogue and at least 100 jokes. Most script problems I've encountered before - writing Hut 33, or Think the Unthinkable. I'm used to hitting deadlines, taking notes and producing new drafts. I've also met other writers through writing for radio comedies. This was especially helpful early in my career when I needed reassuring that nobody really knows what they're doing. When I was starting out, Weekending was the show new writers gathered around. Now it's Newsjack. Meeting other writers isn't essential but it can stave off insanity. Writer-performers get to congregate in Edinburgh for a month every year. But if you're not a writer-performer, you don't necessarily have a place to gather and TV doesn't really have an equivalent. Plus there is the chance that you might hear your joke or sketch going out on national radio. Or in front of the audience. That can be a real shot in the arm. But radio is an end in itself. It’s a great place to write. The medium itself is certainly intimate. It’s more like reading a novel, where the pictures are in your head – where the special effects are so much better, and far more memorable. There is more to be said. And I have done last February: here. 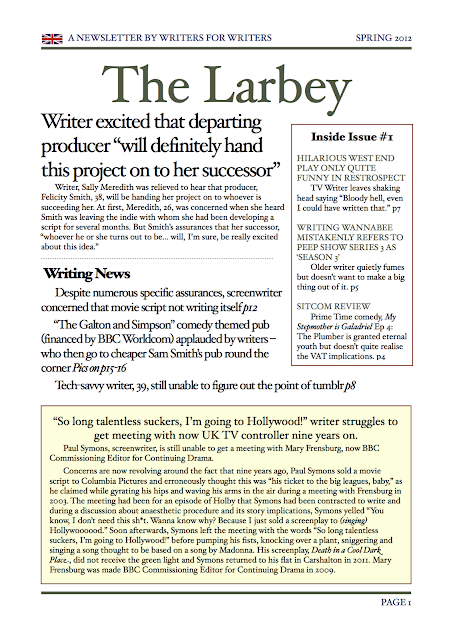 And I mention it because I'm running a day on writing comedy from the radio in London with Dave Cohen on Friday 23rd November 2012 with another on 30th November about writing sitcoms for TV. More info here. Sadly it’s not free or funded by the licence fee, but it's reasonably priced. If you’re looking for some tips on where to start, or how to progress in radio, this is definitely worth a look. Lots of sitcom writers started out writing sketches. It’s probably the best place to start because mastering a sketch is not far away from mastering a scene. A sketch has a clear simple idea, gets you from A to B with jokes along the way and a really good joke at the end. A sitcom scene is similar. Each scene needs a clear simple idea in which a character moves the story along or faces a challenge – ideally two characters moving their stories along and having to challenge each other. And you need jokes along the way and the joke at the end. This can be hard. But I’d like to focus, for a moment, on finishing each scene with a joke. This, in my opinion, is something a sitcom writer should always be striving to do – unless there is a very good reason. You want a feeling of completeness that the scene is over and a comic spring into the next scene – and you need a decent characterful joke to do that with, ideally. There needs to be a very good reason for the scene to not under on a joke. Two possible exceptions would be trying to create an emotional climax that is being played for realism, in order to make the other stuff funnier. Even then, there’s often room of a little kicker. The other exception would be setting up a joke that is immediately paid off at the start of the next scene. But both of these are fairly rare. If you’ve got 12-15 scenes in a show, all but one should end on a joke. And sometimes, not even that. 1. Spend another ten minutes on it. Have a coffee. Walk around. Take a piece of paper and a pen and make some doodles or jot down ideas rather than staring at the script on the screen. But overall, just try harder to think of a decent line or action or comment that’s funny. Sometimes, it really is that simple. 2. Assuming you’ve spent ages on it, or this is the second or third draft and nothing’s presented itself, try changing the penultimate line and see if that sets up a different joke. If that doesn’t work, go back another few lines. Scenes are often conversational stepping stones in sitcoms. You often need to hop from one idea or line to the next, so changing the route might present new areas and ideas. 3. Look for ways to end the scene earlier. If there’s a really funny joke in the scene, is there anyway you could just cut the rest of the dialogue afterwards. Do you really need the rest of the scene? Does it advance the story? Is it funnier than that really good joke? If the answer to all these questions is ‘no’, you’ve got a punchline. End on the funny bit. 4. It may be that you cannot end on that funny line because there’s too much action, story or exposition to wade through afterwards. In which case, look for ways to move that stuff earlier so that you’re able to finish on the decent joke. It feels like cheating, but it’s just away of shaking things up so that your mind is able to see the scene differently and break the brain deadlock . Try it. I’d be interested to hear how you get on. 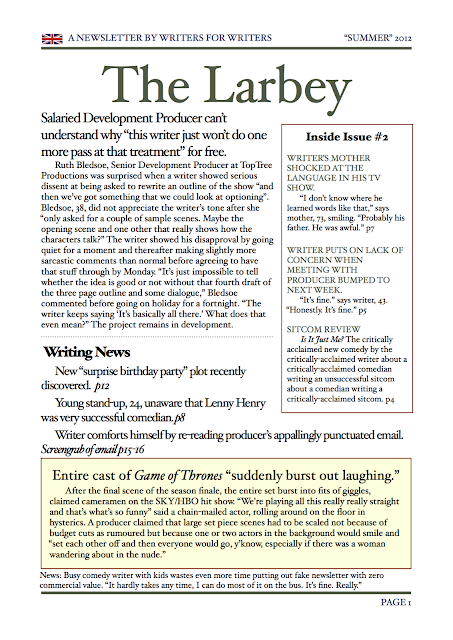 Simon Dunn's helpful and pithy blogpost about settings for sitcom got me thinking. I whole heartedly agree with it. Situation comedies are not about situations but characters. In a way, sitcom is bad title for the genre, since they should be called char-coms. It's easy to see how the term 'sitcom' arose given that they have, until recently, been filmed on a few sets, usually in front of audiences and so the situation the most striking thing about them has been the fact they are confined to one workplace or one home or one situation. And therefore it's easy to assume that the trick of thinking of a new sitcom is thinking of a workplace that hasn't been done before. That in itself is hard enough to do. Since the 1950s, Britain has produced a millennium of sitcoms, set everywhere imaginable. Funeral parlours (remember Fun at the Funeral Parlour - and In Loving Mermory with Thora Hird? No? Try here) and bus stations, factories and vicarages - they've all been done plenty of times. Furthermore, one might pin ones hopes on the setting itself being funny. It rarely is. And it if starts off funny, it will quickly fade because we're drawn to people and stories, not situations. The best jokes are normally funny because of the character and the story, as well as the situation. Falling over is funny. But Del Boy, out with trigger, trying to be a yuppy and impress girls having said 'nice and cool', falling over is very funny. And yet it's only fair to issue a caveat. I've had three different sitcoms of my own on the radio - Think The Unthinkable, The Pits and Hut 33. For all three, I thought of the situation first. Think the Unthinkable was about Management Consultants, The Pits was set in the British Opera Company and Hut 33 was set at Bletchley Park during World War Two. The Pits has largely been ignored and forgotten and I probably know why - it wasn't really about anything. Or at least, it was about professional musicians. It was some funny-ish characters doing funny-ish things with funny-ish lines. The show was all about the setting, not the characters. I didn't do it properly because I was overconfident having done quite well with Think The Unthinkable. I knew how to write scenes and jokes and stories, but I hadn't figured out the characters and the central idea behind the show. A setting can be a good starting point, then. But you really need to know what your show is about and why your characters are there, and when you've answered all those questions, there's a chance you might have something. If you want to be in a room to talk about this more, you could do that with Dave Cohen and myself at the second of these writing days in November. The fact is that most writers do know what to put - roughly. In fact, being told what to do is our least favourite thing. We like the freedom of a blank page on which you can write 'The Prison Guard kicks the prisoner to death' or 'Leonardo Da Vinci grabs his helicopter and flies off into the sunset', depending on your mood or intention. Besides, you don't start with a blank page. You're writing a script based on an outline (unless you're Carla Lane who, let's face it, was more successful than most current comedy writers combined). My outline is a fourth draft of a show and character that I've been mulling over for several months. The outline contains lots of jokes and bits of dialogue. And it's 3000 words long. The finished script should be less than 6000 so, if you like, I've already written half of it. The least I can do is turn the outline into talking and stage directions and I've got something half-decent. And other jokes will come. I know they will. They always do. I've written or co-written over a hundred half-hour scripts for TV and radio. And the jokes do turn up - if I've set the show up right. But every time I think they won't - because the times they don't is because the show is flawed and the outline needs more work. Or you need a fresh idea. But that doesn't happen all that often. The opening scene is the hardest because you're priming the pump. You're setting stuff up, establishing story and character so that it'll be funny later. But it needs to be funny now or they won't stick around for the end. We want to hear the audience laugh four or five times a minute from the start. I've done it before. I can do it again. I should make a start. Once I've closed Twitter, having checked it. And now I need to find the right mood music on Spotify. Something familiar, but not boring. Ideally without lyrics. Bach? Scott Joplin? Chicane? It's all in place. So, erm, I should probably update my blog. Hence this post. But I've done that now. I was making a risotto earlier. And I was thinking about the Back to the Future films. These two things are not connected. But they were happening at the same time. There are lots of things worth noting about these films, but for this blog, let us note two. Time travel is, of course, preposterous. Clearly impractical, and doubly so when you throw in the hopelessly ill-conceived Delorean car. And yet, two words make it believable: 'Flux Capacitor'. Genius. Normally time travel isn't possible, but the Doc invented the Flux Capacitor. Now I believe it's possible, even with a heavy car made in Northern Ireland that couldn't make 88mph if you drove downhill with the wind behind you. Think about it. Flux Capacitor. Neither word is silly by itself. 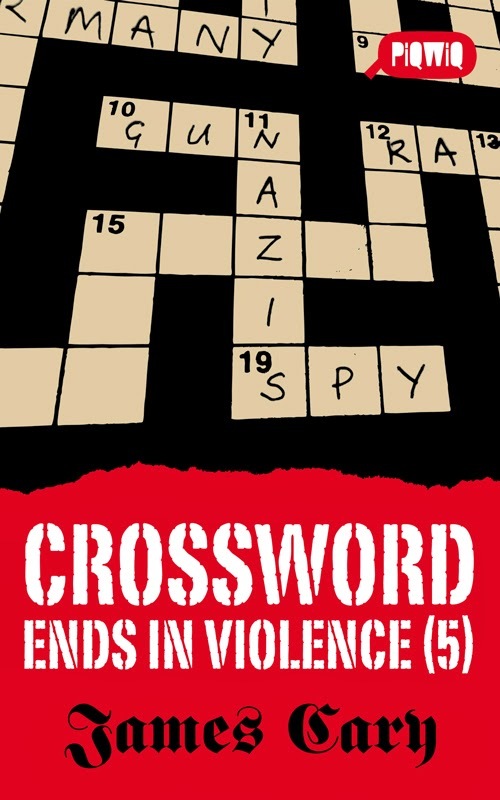 Both words already existed. Blended together they sound plausible. We have a look at the thing - and it resembles a DNA coil, a hydrogen atom and some ovaries behind some emergency glass. Suddenly, all plausibility issues vanished with those two words. We have leapt from the lunatic world of Kelly LeBrock in Weird Science, dodged the apocalyptic craziness of Matthew Broderick in War Games and landed in Hill Valley in 1955. This is the power of words. It is amazing how often a form of words can get you through a ton of exposition, back story or plausibility structures. I'm not sure how much we can learn from this, since these things tend to sneak up on you as a writer, but when you stumble across them, use them. If the audience are prepared to shrug and go 'yeah, I buy that', move on and explore your characters, tell their stories and do the jokes. The more pressure you place on this, the more silly it appears. So don't. Move on. The audience have. It's a pleasing line and it gets a laugh, but on inspection, it's quite annoying. Why? Because of the set-up line. Crazy-haired Doc has a mask and a gun and ends up at the controls of a train with the driver/engineer. He sees the gun and the lunatic, and then says "Is this a hold-up?" Really? He said that? What a curious thing to say. You'd beg for your life, or something. You wouldn't say "Is this a hold-up?" I believe a Flux Capacitor before I believe that. Any set-up line that you don't believe could be said naturally is going to take the air out of your joke. It may be a really good joke, but the clunky set-up will undermine it. If you have that, spend an extra five minutes on it. How could the Engineer's line be more natural? Is there another character there who could say something to help that set-up? If they're not there, could they be there? By this point, it sounds like the joke's not going to fly and it's falling apart in your hands. That's no bad thing. You've found a weak point and can now make it better. Think of another jokes. This is already an extraordinary situation ripe with possibilities so it shouldn't be hard. Five more minutes. Hey, no-one said it was easy. But then again, thinking up jokes for people to say on hijacked steams train in the Wild West so a Delorean can reach 88mph and take our heroes back to the future isn't exactly work, is it? The hit TV show 24 revolutionised television, in my opinion. Here was a show that demanded you watch every last second of it. In order. Drifting in an out wasn't an option. And if you watched the first TV show, you were hooked. I remember seeing bleary-eyed friends of mine and asking how many episodes they had watched the night before. The answer was often 4 episodes or more. It was the TV equivalent of crack cocaine. The trick, of course, was to stop watching an episode half-way through before they built to the next cliffhanger. There were only a couple of annoyances in 24. One was the totally unbelievable wireless communications enjoyed by Jack Bauer and his 3G wi-fi phone several years before 3G wi-fi existed. We could forgive this trope because maybe CTU had access to cool stuff and it moved the plot along. The single most annoying thing in 24 was Jack's infuriating daughter, Kim, who kept putting herself in danger for baffling or non-sensical reasons. She was a poorly drawn character anyway and very much a concept or foil rather than a person. But she was also pushed around the story like a pawn in a game of speed chess. It made for very unsatisfactory viewing and caused much shouting at the television in my house. Motivation is just as important in comedy as drama. In 21-28 minutes of comedy, everything happens for a reason. And people do things for good reasons, or at least reasons that make perfect sense to that character in that situation. I'm thinking about this at the moment because I had to fix a script I've been writing this morning in which a lower-status underling is briefly sassy with a higher-status boss character. The underling is a try-hard and eager to please his boss. But for various reasons, we need him to stand up to his boss who is asking too much of him on this occasion. If I'd left it as it was, it would have looked very strange and, worse, the audience would assume there was a good reason for the underling taking a stand, and they would have been disappointed and confused. And a confused audience is not happy and doesn't laugh. In this case, I tried to find a way around it, so that this underling did not need to stand up to his boss. But we needed it to happen this way. In the end, I found a neat way through it (if I do say so myself). The underling stands up to his boss by mistake, through a misunderstanding. And to make the misunderstanding believable, I made it part of a running joke which features in the very first scene of the episode. It's a pain to have to thread things like this through the script, but it's better than a character doing something for no good reason. Your characters need a motivation for every action in every scene. Every action they perform, every line they say - and the way they say it - is part of an overpowering, overarching desire or need that drives them. This is why planning an episode takes a really long time. I don't start writing a draft of a script until I have a 3-4 outline of the episode with at least one paragraph for every scene. Even then, I often get halfway through a scene and realise at least one of my characters is adrift and 'just doing stuff' or 'saying stuff' for no good reason. If you read your script back and it's just not hanging together, this might well be the problem. Do you know what your character wants out of life, consciously and/or subconsciously? What is their quest in this episode - and how does this action fit into that? You need to do this for every character in the script, not just your star or hero. Otherwise, you have a Kim Bauer on your hands. And let's face it. Nobody wants that. There's a lot of talk about the God Particle at the moment. They've found it. Or at least they think they might have found evidence that suggests they may have found it and it turns out they were right about Physics generally all along. Which isn't bad. Now, I know what you're thinking. 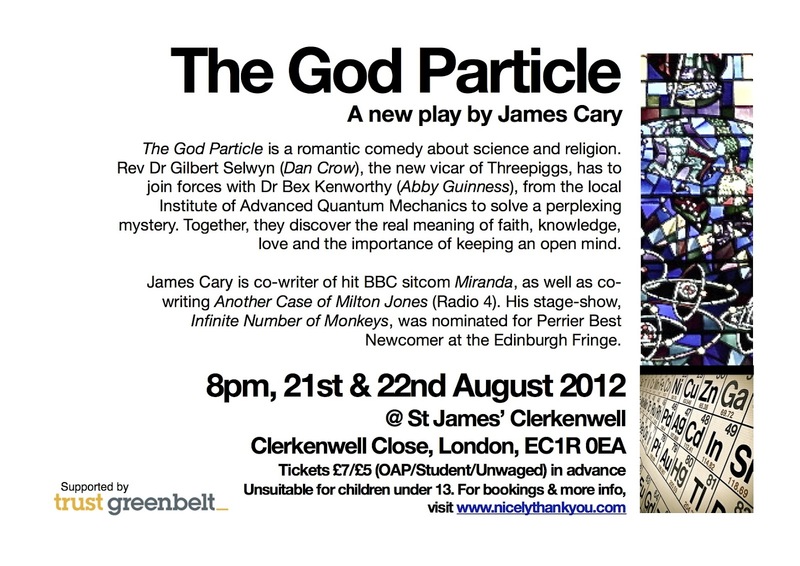 "If only there was some kind of theatrical comedy called the God Particle that I could see in London towards the end of August." Good news. I've written such a play. The God Particle is a romantic comedy about a vicar and a quantum physicist who are brought together by circumstances, and they bicker and argue about life and religion like Maddie and David from Moonlighting. It's takes place in the village of Threepiggs and is based around a quotation by one of my favourite writers, GK Chesterton who said "The point of having an open mind is the same as having a open mouth: to close it on something solid." This sounds witty but is it true? The scientist would argue not. What is it to have an open mind? Does that mean never believing anything? The play looks at all that. With jokes. And lasts about 75 minutes. Do come. 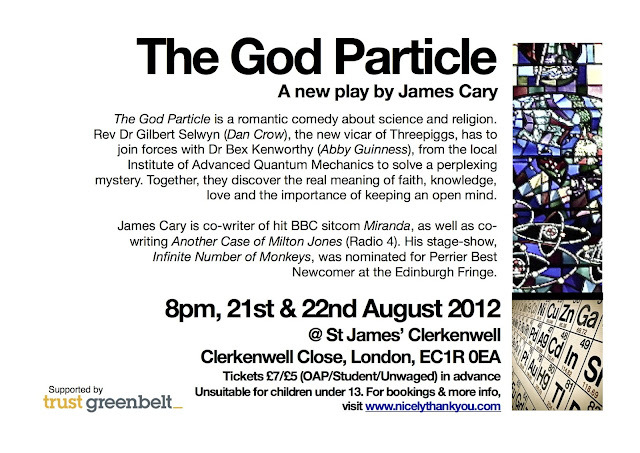 It's on at St James's Church, Clerkenwell, EC1R 0EA (here) on Tuesday 21st & 22nd August 2012. You can book tickets for 21st here and for 22nd here. Flyer below. In the last post, I wrote about the importance of story and structure and character in sitcom - and the dangers of rushing to write a script. Character development and storylining take ages, especially if you're doing it right, and cutting corners normally backfires. Winging it or joking your way of out trouble is tempting but hardly ever works. But that is not to say that you shouldn't write any dialogue until you're done your fourth draft of a detailed scene by scene breakdown of the episode. If you can hear the characters talking, write it down. Fast. Grab a napkin and a lipstick if you have to. But get it down. It's worth having. I've been working on a new idea and will be writing a script very soon. I have the characters in place - although I've just merged two characters into one - and a rough idea for a story. But then, based on one line in my head, the main character had a conversation with her daughter in my mind and it sounded funny. So I frantically started getting it down before the voices in my head stopped. They were arguing about something and it escalated and it was funny. I wrote about three pages before it felt like I was ready to stop. That script fragment then helped me as I formulated the story. A few days after that, I was swimming and thinking about the show. Another conversation started to take shape in my head. It was between the same two characters but felt like a conversation they'd have at the end of the show. It seemed like very useful dialogue and, rather than risk forgetting, I got out of the pool and typed out the conversation on my smartphone. It was about two pages of dialogue in note form. And when I got home, I typed it up. I'm still working on the story. It's still not quite there, but it's coming. The third act B-Plot doesn't work yet, but the emotional beats of the story are in place and I've got some dialogue and characterful jokes for it. I may well end up ditching it, but it helps to have it, for morale if nothing else, and the characters are now talking to each other. Yes, I have voices in my head. And I'm very glad about that. A link to some pearls of wisdom from Pixar has been doing the rounds on Twitter recently and we ignore these pearls at our peril. And yet, the ambitious young comedy writer might turn their snout up at these pearls. And I can understand why. After all, there’s nothing about comedy on that list – and it’s all about character, focus, story, feelings, yadda yadda yadda. So far, so Woody. 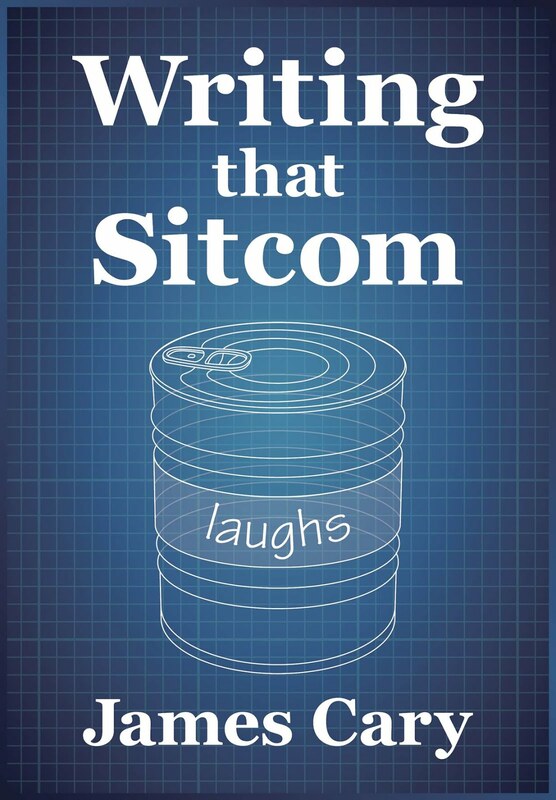 The art of writing sitcoms requires all of the above skills – you need ideas and jokes - but also a bunch of other skills. It’s why it’s so hard. You need to be able to establish characters, tell a story that suits those characters and make it funny. All within 20-28 minutes. Ideally, it needs to be funny because it’s those characters in that story. The best jokes are often very small ones, but they mean so much because of the character and the situation. Sketches are like pop songs. Three minute nuggets of catchy, carefully honed perfection. What’s not to like? The sitcom is the half-hour symphony with high and lows, repeating themes and a crescendo. It requires careful planning, hard work and, above all, confidence, to pull it off. Scripts that lack confidence are easy to spot. They’re full of jokes, sometimes good ones, occasionally highly original ones, but you don’t really care. There’s not enough to keep you turning the pages. It’s what-I-call “people talking”. People with names trading lines, wise-cracks and insults. The problem is that highly successful shows can look like they’re just people talking. Let’s take Friends. It was such an exciting show when it came out. But it remained exciting through its long run. How? And at the start, everyone liked it straight off because of the jokes. Everyone’s favourite character was Chandler, because Chandler just was funny. He said funny things. The kind of things that comedy writers would say. That was his thing. Being funny. Nice trick. Phoebe too. She was crazy and said funny things. And Joey. He liked the ladies and was dumb as nuts. But the show wasn’t a huge multi-billion dollar long-running smash hit because of Chandler, Phoebe and Joey. It was because of Ross and Rachel. Their carefully paced and calibrated story kept people coming back for more and more. 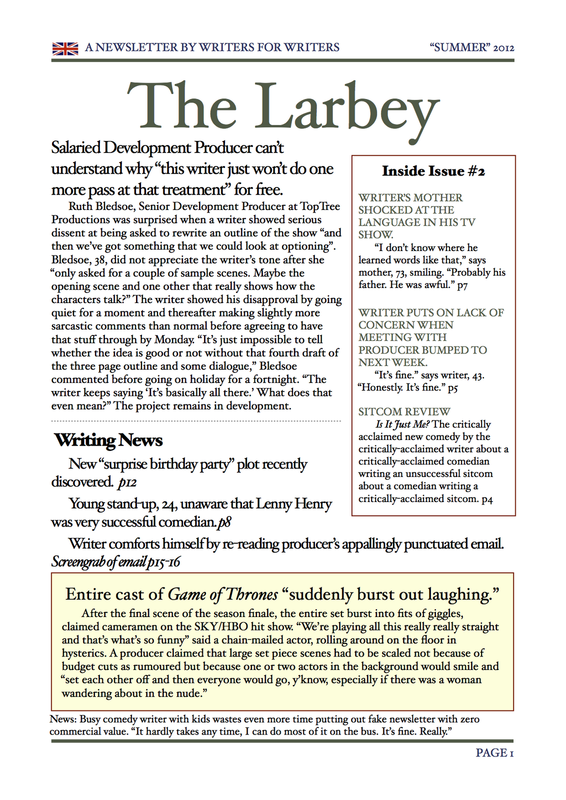 Writing sitcoms is more than just joining up jokes. Yes, Graham Linehan is open about how he writes sitcom scripts, seeing funny set-piece scenes in his mind’s eye and working how to get from one to the next. But don’t do it his way even though he makes it work. Carla Lane, I’m told, didn’t used to plan her episodes of, say, Bread, in advance. Don’t do it her way either. She made it work. (In front of nearly 20 million people, let's not forget) It is unlikely any of us have the exact same skill set as Mr Linehan or Ms Lane. We need to do it like Pixar. All of this is a long way of saying that sitcoms need characters and stories. You need to get those in place or your jokes just won’t count. A young comedy writer might think he can gag his way out of trouble. A more experienced hand my think the same. After all, who cares about the plot if it’s really funny. But thinking of better jokes won’t help any more than spending a week buffing up a Ford Cortina. At the end of the day, it’s just a Ford Cortina. So, if you’ve got a good idea for a sitcom, or an episode, go through that Pixar list and ask yourself those difficult questions. Or get some help. Ask someone else who's strong on story and character to help you. In the long-run, it’ll make writing your show much easier. And then when you're got your brilliant characters and carefully crafted plot, promise me one thing. That you'll write some jokes? Thank you. It's all in the title, really. And yet most of us can never get used to this. I think British comedy writers feel this pain especially acutely. Allow me to explain my self-pitying assertion. Let's back up briefly. I've been listening to lots of Nerdist Writers Podcasts, which are brilliant, by the way. They talk about failure as much as any writer does - which is a lot, even though the writers on these podcasts are broadly speaking quite successful. Some insanely so. Most of us listening are less successful. But there was something else that was bugging me as I was listening in the UK that made me wonder what the difference was. In USA there are plenty of comedy writers who make a really good living working as a staff writer on one of the dozen or so shows in production and the hundreds of pilots to make a pretty decent living. Then there are the comedy-dramas, the thrillers, the medical programmes and the 'procedurals'. In short, there's loads of work out there and essentially it's possible to 'get a job'. Over here in Britain things aren't like they are in America. There are a few long-running shows that are team written but they're all medical (Holby, Casualty and Doctors) and I'm pretty sure they're not run along the lines of those American shows. Other shows, once established, are opened out to others writers but the teams is small and they're not making 26 episodes in a season. In short, if you want to be a comedy writer, you have to create, pitch and write your own show, which takes ages, while fending off the producer's suggestions about bringing in 'other writers' because this, frankly, may be it. The writer may be living off the script fees and decreasing residuals for some years to come. The writer has to gorge himself because the next feeding frenzy might be years away. Or may never come. And so writing comedy in Britain is very personal. Which means that failure is all the more painful. But the problem is that failure is so common. The main reason for this is that hundreds of writers, stand-up comedians and writer-performers are churning out scripts trying to get shows on small number of channels with relatively few comedy slots - even though right now things have probably never been better with Sky's spending contest in full flow, Channel 4 spending money on original comedy they previously had to pour into Big Brother, and ITV are supposedly back in the game (even though ITV have said they're serious about making comedy every 18 months since they stopped making Hardware). And Comedy Central and Dave are making original comedy too. And, of course, BBC Radio broadcasts more comedy that all above combined. And yet despite a buoyant market, failure is still a borderline certainty. I can vouch for that. All of my modest success have ended in indignant failure. I was very happy writing Think the Unthinkable for Radio 4, which won a Sony Silver, when I was told to stop. I was equally happy writing Hut 33 for Radio 4 when I was also asked to cease and desist. TV versions of both of these were proposed and rejected. I've since proposed two new sitcoms for BBC Radio 4 that have been turned down like bedspreads, as Bertie Wooster would say. I've probably written over half a dozen TV pilot scripts that have come to nothing. One recent one was especially painful since it was a failure that over three years in the non-making. Failure is part of the job. The only useful question is how to deal with it and get used to it. And comedy writers, if they're not careful, will apply sitcom logic to their own lives. In sitcoms, everyone gets their just deserts. Our hero triumphs. Kind of. Our villain fails. Sort of. Justice is done. In a way. The point is that in sitcoms, things don't happen for inexplicable reasons. That's bad plotting. But they do in life - and especially in the life of comedy writer. The producer says, "They don't want another series of your show, Mr Cary." You say, "But, the award? And the universally positive reviews? And aren't the cast really popular now..." At least you say that if you're Mr Cary responding to a deus ex machina. So how are we meant to react when we experience failure? Everyone has their own way of coping, but it's always worth bearing a few things in mind: you don't know the real reason for your rejection and you'll probably never. The commissioner and/or controller has totally different concerns from you - and your show is very low down on their list of 'Things to Give a Toss About'. It may be they have a similar show, or think they do. Or are pretending they might. Or they just don't like your show and are using low ratings as an excuse. Or they love it but their boss hates it. Or they never liked it, and they didn't commission it and they're not going to recommission it. Or their sister's boyfriend son said your show sucked. The point is: it doesn't matter. It's not about you or your show. It never was. It was only about you to you. On this Nerdist podcast, someone explains it well. Either Lawrence, Levine or Hatem. They say the whole business is like a crap shoot - and you only get one of the dice. So you ultimately have no overall control. It's a compelling and, in my opinion, accurate picture. There's no point getting all worked and stressed about this. Or start scoring points. It doesn't get you anywhere. It's like barking at the moon. This is easier said than done, of course. Not long ago, I was expecting to co-write another series of Another Case of Milton Jones after previous shows were largely well-liked. Radio 4 said something along the lines of 'We feel this format has run it's course.' Who knows what that really means? But anyway, a few weeks later, we won a Sony Silver for the now-cancelled show. There is a temptation to crow and blow raspberries and shout 'daaaah! Told you!' but it doesn't get you anywhere. Radio 4 make their decisions based on criteria that only they truly understand. Even if they knew about the Sony award, it probably wouldn't have made any difference. So, much better to expend that crowing energy on thinking of a new show. We're writers. We're not in control. And neither should we be in control. But what we do control are the words on the pages of our scripts. All we can do is make them as good as they can be. And try and enjoy that process. And if a TV channel doesn't want to spend £250k per episode shooting my sitcom, then that's not the end of the world, surely? Nobody died. Okay, maybe I didn't get paid, and that's annoying, but if we start looking for cosmic reasons for everything, we're going to get confused, angry and disappointed. Writing's hard enough - without extra confusion, anger and disappointment. It may be a surprising to some, but I've only just got round to watching The Inbetweeners. I missed Series 1 when it first came out, and I kept failing to catch-up so I held off watching anything assuming I'd get around to watching it. I did not. Until Saturday. I have now seen the first four episodes of The Inbetweeners. It's good, isn't it? You all knew this and told me this, but I didn't know this and frankly didn't believe you. But I am won over. It's a good show. But here on the sitcomgeek blog, we can't just enjoy something and move on. We have to think about it a bit more than that. What can we learn? The show is not just four teenagers talking about girls and swearing at each other, although there is plenty of that, and well-written swearing it is too. It's not about clever plots, misunderstandings and brilliantly timed reveals. (In fact, in the first four episodes at least, the plotting seems a little ropey). But the show is about something. This is seems obvious, but if you want to create a hit, think long and hard about the premise and the idea behind it. Ask yourself what's it about, because if it's about something, it can lack a few jokes or cope with some dodgy storytelling and be great. Watch early episodes of Only Fools and Horses. It really isn't all that funny. It's convincing and believable, and it's about something. John Sullivan created a world that he knew. A show can be smart, well-written, riddled with jokes and technically flawless but if it doesn't create a world that is convincing, or that the viewer feels they can't relate to, it's unlikely to be a hit. Even better, The Inbetweeners isn't just about something, but about a stage of life - in this case, that tricky stage of being in sixth form at school, treated like a child but expected to behave like and adult whilst coping with wildly pulsating hormones. The writers have brilliantly captured that stage of life. Stages of life are worth thinking about for sitcoms. It sounds odd to mention them in an article about The Inbetweeners but Friends and One Foot in the Grave are similar. In Friends, the creators identified that there were many people living in a hitherto untelevised period of life. They were graduate-type young-ish people no longer with their parents but yet to marry and start their own families. And so they formed close bonds of friendship with their peers. It's there from the opening song 'I'll be there for you'. And millions of people understood that stage of life and wanted to part of that Central Perk crowd. A billion dollars later, the rest is history. One Foot in the Grave is about another stage of life - the retired man who still feels he has still has something to give. And his constantly being sidelined makes him angry, along with every tiny thing in the world. So, the question we can ask ourselves about that sitcom script for that show we're creating that doesn't seem to be working - Could it be about a stage of life? Probably not, but worth asking.